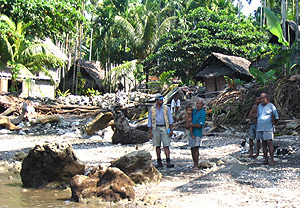 Jason Elemunop (left) of the Geological Survey of Papua New Guinea and lapuns (elders) of Bilbil village, Madang, Papua New Guinea, examine coral boulders from the tsunami deposit upon which the village is built. Oral traditions along the Madang coast record a catastrophic tsunami at least 10 generations ago, which may correspond to the tsunami that washed up these boulders. Photo by Simon Day. The infamous Indian Ocean tsunami that struck on December 26, 2004, caused tragically high mortality--from 10 to 90 percent of the population at various locations. Yet in 1930 a tsunami of similar size, generated by an earthquake near the Ninigo Islands, struck northern Papua New Guinea and killed just 0.1 to 1 percent of the population on the coast there. Why were these islanders living earlier in the century better protected? According to tsunami expert Simon Day, they had heard stories passed down from their elders about how to recognize a tsunami and how to respond. These people knew that when they saw the sea draw down, it was time to run for the hills. "Oral traditions are a very efficient means of tsunami education," said Day, a visiting research associate in Earth and planetary sciences at the University of California, Santa Cruz. Day made this discovery as he and his colleagues searched an area around the Bismarck Sea (north of Papua New Guinea) for past evidence of giant tsunami waves--in particular, for large rocks that were swept to high ground. As he and his colleagues visited villages and asked local leaders for permission to explore the land, the scientists heard and collected stories about past tsunamis. The stories, it turned out, could be linked to several specific geologic events that earlier generations had learned from. "It became apparent that oral traditions were going back 500 years," Day explained. "The stories contained information about how to recognize when a tsunami was about to come, such as falling sea levels, and told how people should take action. That's the reason why casualties [in 1930] were so low." In contrast, Day found from a review of the literature, casualties from other tsunamis are much higher in areas inhabited by recent immigrants with no indigenous knowledge about these events. For example, video evidence showed that many people in Thailand in 2004 did not recognize the warning signs of a tsunami and did not realize that there was a safe place to go less than one kilometer away. "Essentially, a lack of education caused an awful lot of mortality there," he noted. Day presented these findings on December 11 at the annual meeting of the American Geophysical Union in San Francisco. His talk was entitled "Tsunami Hazard Awareness from Past Experience and the Differing Vulnerability of Indigenous and Coastal Populations." Near Madang in Papua New Guinea, Day heard stories about two unusual events: a big earthquake that had caused the land to rise and the sea never to return, and a huge tsunami. Using carbon-14 dating on dead coral reefs now sitting on dry land, Day and his colleagues found physical evidence that such an uplifting caused by an earthquake had indeed occurred around 1450 AD. And a large tsunami struck the islands around 1500 AD. He also met some very old residents who knew these stories and described the 1930 tsunami that had sent them scrambling to the hills. Rock deposits suggested that seawater levels had run up several meters. That tsunami was bigger than previously thought, similar in intensity to the 2004 Indian Ocean tsunami as it struck Thailand. Day's studies suggest that preparatory education and self-warning are critical for surviving a massive tsunami. "The upshot is, if we could reproduce this level of awareness that some people get from traditional stories, it would serve as a very effective way to mitigate the effects of tsunamis, and it could be transmitted over many generations," he concluded. Interestingly, oral traditions can serve this purpose even if not accurate scientifically. "In Papua New Guinea, there's no such thing as a natural disaster--it's always blamed on sorcery by a rival tribe," Day explained. "In some places there, an earthquake is considered to be a byproduct of the spell that a sorcerer uses to cause a tsunami--the two events are related. But most important, the stories explain what to do, so they're useful." According to Day, a modern tsunami education program could be modeled after one developed to prepare at-risk populations for volcanic eruptions and mudslides. Known as "Education for Self-Warning and Voluntary Evacuation" (ESWAVE), the program was created by volcanologists after the 1985 Armero eruption in Colombia. That disaster killed 20,000 people, who were swamped by floods, ash, and debris because they did not understand the significance of the warnings that were given. In 1991, volcanologists used extensive education campaigns to prepare people--including personnel at a U.S. Air Force base--for the eruption of Mount Pinatubo in the Philippines. Film footage from earlier volcano disasters helped bring the message home. Now, video clips of the 2004 Indian Ocean tsunami are available and these could also be used in a similar education program, Day said. "The tsunami research community needs to learn some lessons from the volcanologists in order to better mitigate the hazards," Day noted. "If recent film footage were used in the right way, it could be a very effective way to educate people about tsunami hazards." To save lives, populations at risk should be educated first, even before governments worry about setting up regional tsunami warning systems, he said. Note to reporters: You may contact Simon Day at sday@pmc.ucsc.edu.